We all know what first dates feel like. The unavoidable awkwardness and soul crushing anxiety about your appearance, your social habits, your grammar. 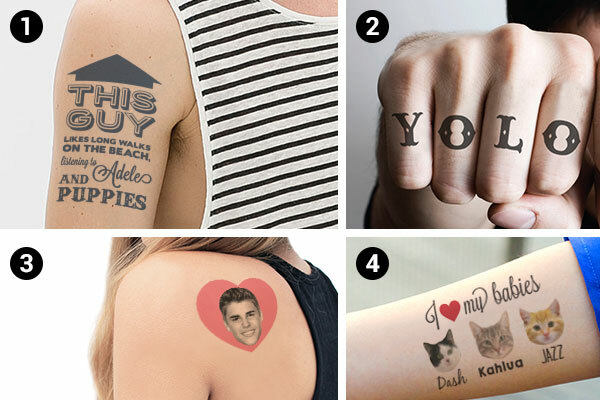 Not that we expect you'd be the kind of person to do this, but just in case you are the type who likes to create your own self-adhesive body art, we've created this hand list of custom temporary tattoos you should never wear on a first date. Unless of course, it's a really, really bad first date. Then you can excuse yourself to the bathroom, roll up your sleeve, whip one of these babies out, peel, stick and voila! Bad Date Repellent. 1)This Guy likes long walks on the beach, listening to Adele and puppies. This guy needs to not wear his dating profile like a billboard. Why it's a bad idea: Your date has probably already creeped your online dating profile, your Facebook profile, your Twitter, and your Instagram. They already know a lot about you. So lets leave at least a little bit undiscovered. Also "This Guy" shouldn't be referring to himself as "This Guy". 2) YOLO. This trending acronym may now be in dictionaries and added to Scrabble's list of acceptable words, but unless you are at a music festival or are from the Jersey Shore, don't do this. Why its a bad idea: YOLO is the stupid person's carpe diem. And a temporary tattoo that says carpe diem is not the least bit original. You will look unoriginal and unintelligent. 3) Heart Justin Bieber. Lets skip the charming prelude. Why its a bad idea: Because its a bad idea. 4) I Heart My Babies. You know what's cute? A fuzzy little kitten. You know what's not cute? A crazy cat lady. Why its a bad idea: We understand you dedication to your feline companions, but having a physical monument to them on your body is in no way necessary. Plus, what if your date has allergies. 5) No Ragrets. Or any other word with a spelling or grammatical error. Temporary tattoos are awesome, but if it is spelled wrong, it might as well just say "I'm a moron". 6) Heart Mom. Gentlemen this one is for you. We know you love your mothers, just as you should. They did bring you into this world after all. Just don't express that love in the form of a heart shaped temporary tattoo, especially on a first date. Why its a bad idea: Your date is likely looking for a man. Not a momma's boy. Two people is a hot date, a relationship, and even possibly one day way in the future a blissful marriage. Two people and your mom is a deal breaker. 7) The Future Mrs. Jones. Ladies, listen closely. We understand how giddy girls can get before a date with a particularly fine specimen. You may fancy yourself in love, daydream about your future wedding, doodle your names in your notebook, and that's fine. Just don't do it on a temporary tattoo and then stick it to your body before your date. Why its a bad idea: You are putting the cart wayyyy before the horse. You will scare your poor date away. At least make it to a third date before you do that. 8) Not Infected. Awesome temporary tattoo for practical jokers, but not for first dates. Why its a bad idea: What your date will read is "this person is a walking cesspool of germs and disease". Humans carry a ton of germs and bacteria anyways, but no one wants to make out with a Mad Cow virus. Bad date? Start by causally mentioning you just spent six months in the Amazon researching an indigenous species of howling monkeys. Anyone watched Outbreak (1995)? There you have it ladies and gents! First impression are important. 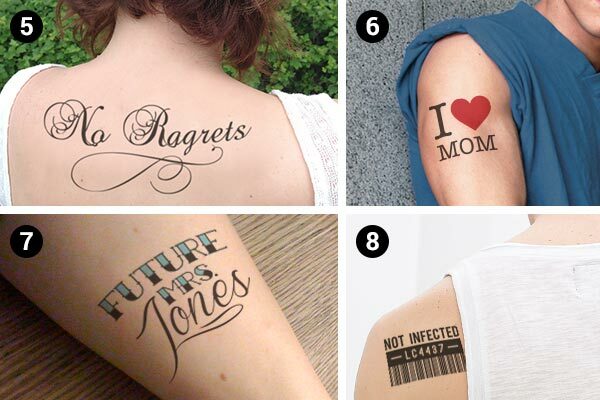 Now you know if you are going to play with some custom temporary tattoos, which ones to avoid, or at least scrub off before your first date.